I've finally had a chance to do a showdown between the Amazon Kindle Fire and Apple iPad. My father was visiting for Christmas and my brother had sent him a new Kindle Fire for Christmas. This gave me the opportunity to set up and test the various capabilities before my dad flew away with it. This is his first experience with either an eReader or a tablet computer. My father is hard of hearing and a little forgetful, so it is a bit of a challenge, although once it is in the proper mode, he really seems to be enjoying it. He has always been an avid reader and lover of poetry (still recites Milton's Sonnet "On His Blindness" every night at the dinner table), plus he is fond of a good western. While all-in-all the two tablets are functionally the same, there are some seemingly odd differences between Amazon and Apple products. This can be put down to the fact that Amazon is at heart a book selling company while Apple is a hardware company. At $199 the Amazon Kindle Fire is one of the most reasonably priced tablets on the market. It's likely that Amazon is selling it very close to cost, if not losing a little money on each unit. Amazon sees the Kindle Fire as a platform for selling everything else they do—e-books, streaming video, and all their other retail operations. The Kindle attempts to keep you within the Amazon fold by making it a little more difficult to operate with non-Amazon concerns. In spite of this tendency to isolate the user, the Kindle Fire offers enough flexibility that straying outside is not impossible. A major part of the difference in price between the Kindle Fire and Apple iPad can be seen in the size of the tablet. The size discrepancy (7" screen for Kindle versus 9.7" for iPad) doesn't strike home until you see them side by side (see Figure 1). The actual viewing area of the iPad is approximate twice that of the Kindle Fire. This is significant—especially if more than one person is simultaneously viewing a Netflix video on the tablet. Figure 1. 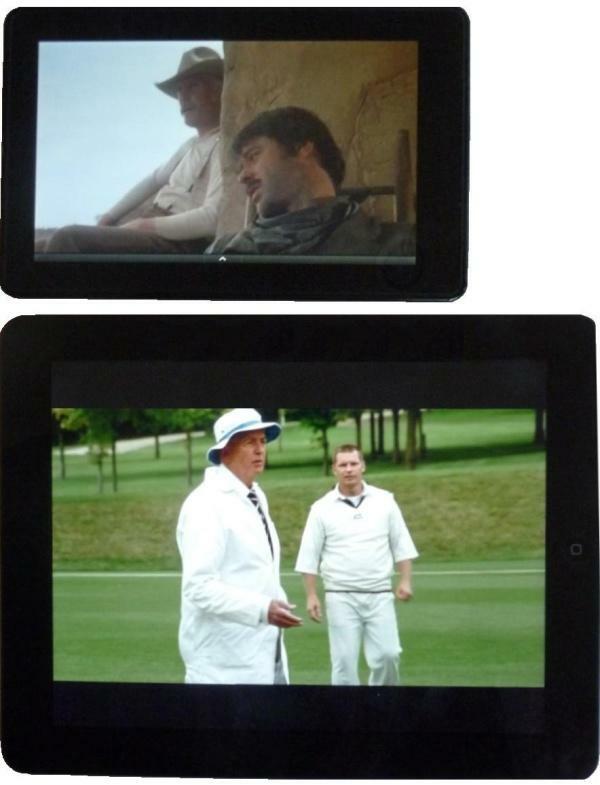 The iPad (bottom) has twice the viewing area of the Kindle Fire (top). While the Kindle Fire weighs much less than the iPad, it still feels heavy for its size. It is sturdy, but does not compare to the light easy feel of other Kindle eReader models. Being smaller is not necessarily a negative for the Kindle Fire. There are numerous advantages to its size when traveling or just sitting in a chair while watching a video. However, the Kindle Fire is definitely a one-person tablet, while the iPad is easier to share. The smaller Kindle Fire also offers more problems for people with fat fingers. Tapping Web links can be difficult unless the screen view is expanded. The screen resolution for the Kindle Fire (1024 X 600) is competitive with the iPad (1024 X 768) especially considering its size. Size does matter. For many people, the Kindle Fire will be their pick because of its smaller size. For others the larger viewing area will push them toward the iPad. Both the Kindle Fire and iPad use the same gestures for scrolling, zoom in and zoom out, so Web browsing is pretty much the same experience. 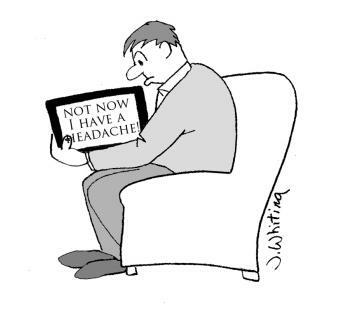 Yet, using the Kindle Fire was less comfortable. This was primarily due to the shape of the screen and its smaller size. When the Kindle Fire is oriented vertically, the screen was too narrow. When horizontal, the screen was too short for relaxed Web browsing. The shape of the less panoramic iPad screen seems better for viewing most Web pages regardless of the tablet orientation (vertical or horizontal). Also as mentioned above, the links on Web pages on the Kindle Fire were more difficult to activate due to the same small size. I often needed to expand (zoom in) the page to make tapping the link easier. As I previously stated, the Kindle Fire browser does not allow direct downloading from a Web site. To get outside content on your Kindle Fire you need to attach the tablet to a computer (with the previously downloaded the target files) via the USB port. This is easy enough to do, but out of the box the Kindle Fire does not include a USB cable—only a power adapter which uses the same USB port on the tablet. (This might not be a problem, since many cell phones and GPS devices use the same micro USB connector for recharging. You may already own the proper cable. You can get at Universal Mini-USB to Micro-USB Adapter at Amazon for 38 cents—50 cents shipping—or a six foot micro USB cable for $1.59.) It seems that Amazon does not want to make it too easy to load outside content onto a Kindle—although it is cheap to remedy. Amazon has an e-mail system called Kindle Personal Documents Service which allows you to e-mail files to your Kindle Fire. You are given an e-mail address in the form [name]@kindle.com. When you send a compatible file (e-books, documents, photos, etc.) as an attachment to that address, it will be converted to Amazon format and send to your Kindle the next time it is available. All of these files are placed in the Docs folder on the Kindle Fire and can be viewed directly from there. As far as I could tell, these files could not be moved to the Books folder or the photo application—even with the aid of a USB connected computer—although there does appear to be a method to first download the document to your computer, then do a USB transfer to the Kindle Fire. Five gigabytes of Personal Document Archiving space is included with the Kindle Fire. Any documents that you send to the Kindle via the Personal Documents Service is automatically added to the archive. While there are plenty of ways to add content to the Kindle Fire, the iPad seems to be much more flexible in both the area of Web downloading and computer connected file movement. If you like to obtain e-books and other documents from multiple sources then direct downloading of Web content to the iPad is a significant advantage over the Kindle Fire. 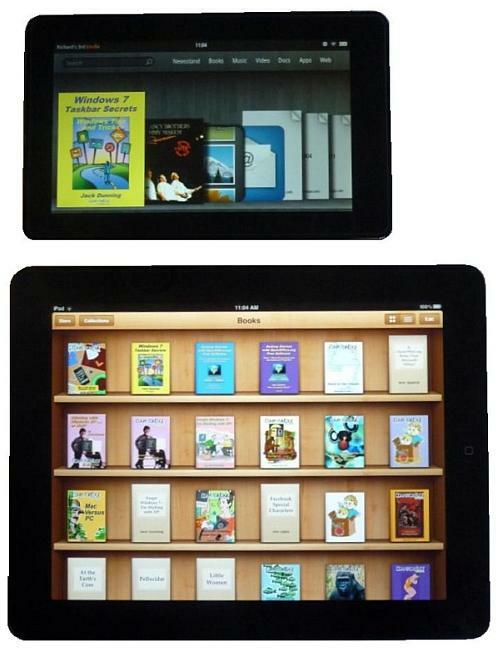 Both the Kindle Fire and iPad have easy access to their online stores for downloading e-books and apps. Since the Kindle Fire is new, the number of apps on Amazon is a sparse by comparison to Apple iTunes. No doubt, if the Kindle Fire catches on (and it appears to be doing just that) then there will be plenty of apps available soon. The one caution I would inject about Amazon is that if either children (or certain people of more mature years) are using the Kindle Fire, you may find that they are unknowingly using "One-click ordering" to buy e-books, videos, or apps. Unlike iTunes, Amazon does not require password confirmation to buy with the Kindle Fire. As far as I could tell, you can turn "One-click" off in your Amazon account, but that does not disable the feature on the Kindle Fire. It seems that the best bet for avoiding accidental purchases would be to remove all credit card information from your Amazon account. The high resolution screen on the Kindle Fire was excellent for viewing streaming video. The quality is certainly comparable to the iPad, although the larger iPad is better for sharing the experience with another person. If viewing a video in the widescreen format, iPad loses some of its size advantage since it requires a black bar on the top and bottom of the screen (see Figure 2). Both tablets have a audio out connection for headphones. Figure 2. Netflix playing on the Kindle Fire (top) and the iPad. Notice the black bars at the top and bottom of the iPad screen when showing a widescreen video. A new Kindle Fire includes one month of Amazon Prime which offers free two-day shipping and thousands of free movies and television shows for streaming. For my father, the main drawback to Amazon Prime videos was the lack of closed captions. He depends upon subtitles when watching television. Headphones don't do the job for him. There is a Netflix app available in the Amazon store. The app is free and is easily downloaded. If you are using Netflix for the first time, sign up with your computer and get one month free. One of the best features for my father is that Netflix offers closed captions on the Kindle Fire. This was unexpected since many Netflix capable devices do not support subtitles. It certainly pleased my father. Kindle Format 8 (KF8) will be the new format for e-books on the Kindle Fire. It will eventually replace the current MOBI format, although Kindle continues to support MOBI files. KF8 is based upon HTML5 and will offer enhance capabilities such as multimedia. The tools for building KF8 e-books have not yet been generally released by Amazon, but it seems that conversion from other formats such as EPUB may be much easier. There is an app called Gallery pre-installed on the Kindle Fire which offers a photo viewing experience very similar to that of the iPad. To load your photos you need to plug the Kindle Fire into the USB port on your computer and drag the folders containing photos into the appropriate pictures folder on the Kindle Fire. When you move a copy of a folder into the tablet it creates an album in the Gallery app. You can e-mail photos to your Kindle Fire via the Kindle Personal Documents Service, but they will be put in the Docs folder and can only be viewed with the eReader. You will not be able to move those e-mailed (and converted) photos into the pictures folder for use with Gallery—even if connected to a computer via USB. Possibly you can download them from the archive, but you will still need to hook your Kindle Fire up to the computer to load them—which defeats the purpose of the e-mailing in the first place. It is possible that you can use the Personal Document Archiving space for storing third-party e-books, photos, music, documents on a Kindle Fire, but I didn't get a chance to test this. If so, then there will be an additional five gigabytes of storage available. Apple has implemented iCloud which can now be used for storage, backup and syncing for your iPad and other Apple devices. iCloud also comes with five gigabyte of free storage. The Kindle Fire has a number of pre-installed apps: "Pulse for music, Audible for audio books, IMBD for information about movies and actors, Quickoffice for working with Microsoft Documents, Facebook for social networking, as well as an app for e-mail and one called Gallery that shows a gallery of videos and pictures on the device." The list of installed apps on the Kindle Fire and Apple iPad look very similar, although some of the Kindle Fire apps (Books, Music, Web) actually appear on the main taskbar at the top of the home page. For e-books and music you will find a button on the main taskbar at the top of the screen. For photos you will need to use the pre-installed app, Gallery. There are some game apps, Facebook (even more non-intuitive than the regular Facebook setup), and a few others on the Kindle Fire in the App section. Some people have complained about the fact that you can't remove (or even hide) Facebook—or other pre-installed apps. Apparently, Facebook is the new scourge for parents trying to raise kids. I'm not sure how many people really care, but the iPad 2 sports cameras (front and back). The Kindle Fire has no camera. How much do iPad 2 owners actually use their cameras? I would be interested to hear. Some people have suggested that the Kindle Fire is not really a tablet computer as define by the market ignited by the Apple iPad. They are wrong. In every sense, the Kindle Fire is a one-handed computing device capable of doing almost everything we've come to expect from a tablet. It is not as big as the iPad (which in many cases may be a plus) and lacks some capabilities (camera), but it will do 99 percent of the things that we want a tablet to do. As time goes by, there will be more apps available for the Kindle Fire and at $199 it is a killer deal. The price is low enough to almost be considered an impulse item. Is the Kindle Fire a threat to the iPad market? You bet! It's interesting to note that the real threat to Apple's iPad market is not coming from the other computer companies, who can't build an inexpensive tablet, but rather the e-book readers such as Amazon's Kindle and Barnes and Noble's NOOK who offer a different view of the tablet computer in the Kindle Fire and NOOK Tablet. Other than being smaller than the iPad in size and price, these new tablets are more similar than unlike Apple's market leader, the iPad. Jack was the publisher of ComputorEdge Magazine. He' was with the magazine since the first issue on May 16, 1983. Back then, it was called The Byte Buyer. His Web site is www.computoredge.com. He can be reached at computoredge@gmail.com. His e-books are currently available at www.computoredgebooks.com.